The US Secretary of State has said that his country will continue to pursue an "aggressive" foreign policy. 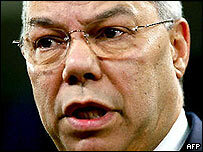 In an interview with the Financial Times, Colin Powell said President George Bush would not alter or curtail his policies abroad in his second term. "The president is not going to trim his sails or pull back," Mr Powell said in his first interview since the election. "It's a continuation of his principles, his policies, his beliefs," he told the London-based newspaper. The president had won a mandate to pursue a foreign policy that was in the US national interest, he said. This policy had traditionally been "aggressive in terms of going after challenges, issues", Mr Powell added, and the president was "going to keep moving in this direction". Mr Bush would take a multilateral approach, he said, but the US would act alone where necessary. However, Mr Powell stressed that an aggressive foreign policy also applied to developing world issues, including Aids and the Middle East peace process. The Middle East peace process was "one of the biggest overhangs in our foreign policy", he said. After disagreements with European leaders over US policy, Mr Bush was "anxious to reach out" to them. Mr Powell explained to reporters on Monday that he would be "spending a lot of time in Europe in the weeks coming up" in an effort to heal divisions. "Our European friends have no illusion that the president wants to have a strong relationship with all of our European friends and allies, notwithstanding any disagreements we have had in the past," he said. However Mr Powell's interview, published on Tuesday, puts a stop to any thoughts that a second Bush term might have heralded a change in US foreign policy, says the BBC's Ian Pannell in Washington. Mr Powell did not address speculation over whether he would continue to serve during President Bush's second term, our correspondent adds.